What do you get when more than 30 members of the Rocky Mountain Elk Foundation from eight different chapters gather in one meadow? After a few hours of sweat and flexed muscle, you get better habitat for elk and other wildlife. The volunteers came together near Pondosa in northern California, some 30 miles southeast of Mount Shasta. The area is prime California elk country. 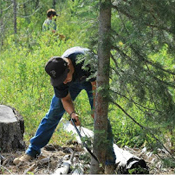 With that in mind, the participants of all ages focused their pruning shears, saws, axes, and other tools on removing conifers that were choking out native grasses and other forbs that provide feed for elk. Volunteers hacked down small trees and removed other vegetation to better open the way for sunshine. As they worked shoulder to shoulder, they also renewed old friendships and formed new ones. And when the day’s work was done, the dedicated volunteers not only firmed up this little portion of elk habitat but also firmed up relationships between chapters, learned more about RMEF accomplishments, and celebrated those accomplishments . . . together! Thanks to RMEF for allowing us to republish this post.